The excellent parkland Kilmarnock Footgolf Course is situated at Caprington Golf Club, just two miles outside of Kilmarnock in Ayrshire. Footgolf Scotland is benefiting from the addition of this 18-hole course, which is open from 9am until 6pm daily. 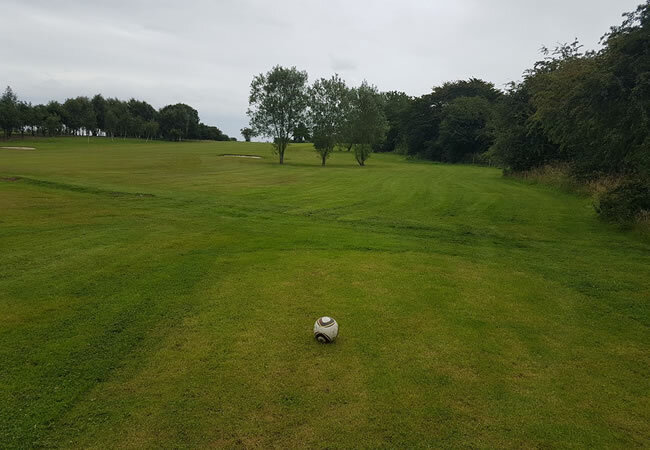 Kilmarnock Footgolf is a friendly course and suitable for beginners as well as those who are frequently found donning the Argyle socks of Footgolf! By Footgolfing standards, this is quite a long course at 2249 yards, so enjoy a long and interesting game. You are welcome to bring your own size 5 ball, or hire one for just £2. Once you’ve finished up on the course, then head on over to the club bar or restaurant where you can enjoy a drink whilst watching Sports TV, or simply enjoy a run-down of the game with your competitors.